What do extensions do for you besides length? How do you avoid damage? Is it right for me? Your hair extension questions answered! Our salon offers a wide array of extension methods and looks for every desire and need. We offer tape-ins, keratin bonds, and sew in techniques. The best way to know what is best for your hair is always to come in for a consultation with one of our many certified stylists, until then we have some answers for you here! Our most popular extension method is our tape-ins. The hair extensions themselves have one inch strips of medical adhesive on the ends which your hair is then sandwiched between. Ideal for thinner hair due to the tape itself not putting as much weight on the hair. The hair is attached to your nape area and also around the face if desired, which can add fullness as well as length. Upkeep is as simple as blowdrying your hair after showers, wearing it up when you go to bed, and a salon visit every 6-8 weeks. This allows for our clients to have the look they desire no matter their length or natural hair texture! We also offer keratin bond extensions. This method involves small wafts of hair with keratin bonds at the tip which are then bonded to your hair in various patterns to give fullness and length. Some hair is naturally thin or has been over process around the facial area and these extensions can aide the journey to a fuller look more seamlessly than other methods. These are easier to hide if updos are desired due to the size of the bonds. Upkeep consists of never leaving the hair wet for extensive periods of time, wearing it in braids to bed, and a salon visit every 3-4 months. Perfect for those who want extensions without constant in-salon upkeep! Our newest extension method is Natural Beaded Rows. It is a method we are excited to bring to the Bay Area through our owner Erica and stylist Adriana. Considered up and coming in the world of hair extensions, this method offers a less invasive feel and a seamless look. This gives you the ability to wear updos and not worry about the attachments showing through the hair. Upkeep requires a blow-dry after every shower, braids at night, and a salon visit every 6-8 weeks. All extensions we offer here at HOC are guaranteed to give you the confidence and results you are looking for! Suited to your specific needs we are here to help. If you are interested in any of our methods schedule a consultation today and one of our many qualified stylists can help you achieve the hair of your dreams! Forget that face lift—perhaps the change you need to feel younger is a new hairstyle. Pixie cuts are great because they emulate a cool, calm and confident nature. But the overgrown top is begging for structure. What happens when she changes up her look a bit? Wow! Look how much those bangs bring out her eyes and the soft waves frame her face effortlessly. When great minds collaborate, beautiful things are born for the rest of the world to enjoy for eternity! 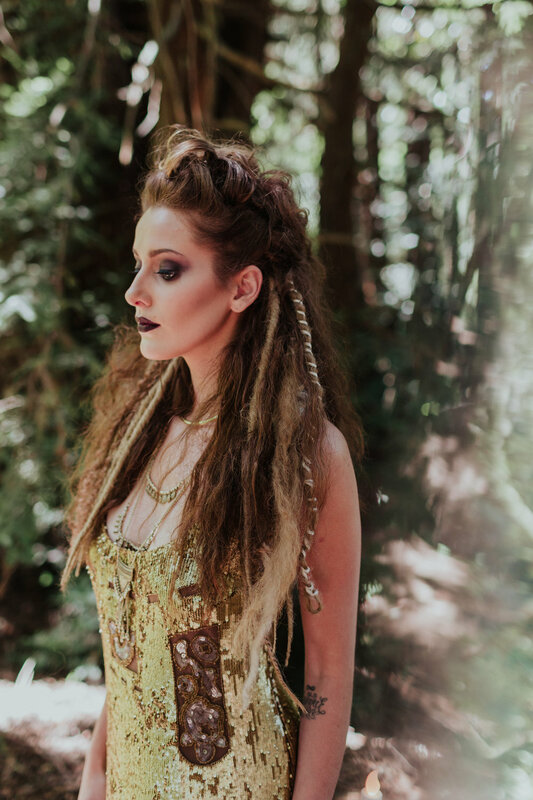 My stylist Malyssa came to me and said “I want to do a photo shoot and my inspiration is Dark Woods!” She then showed me a picture of her vision, I was absolutely thrilled! We talked for weeks about ideas, hair, makeup, location, clothing and so on. These photo shoots are absolutely fun to do, but at the same time they can be exhausting. For months you eat, sleep, and breathe your thoughts and ideas. 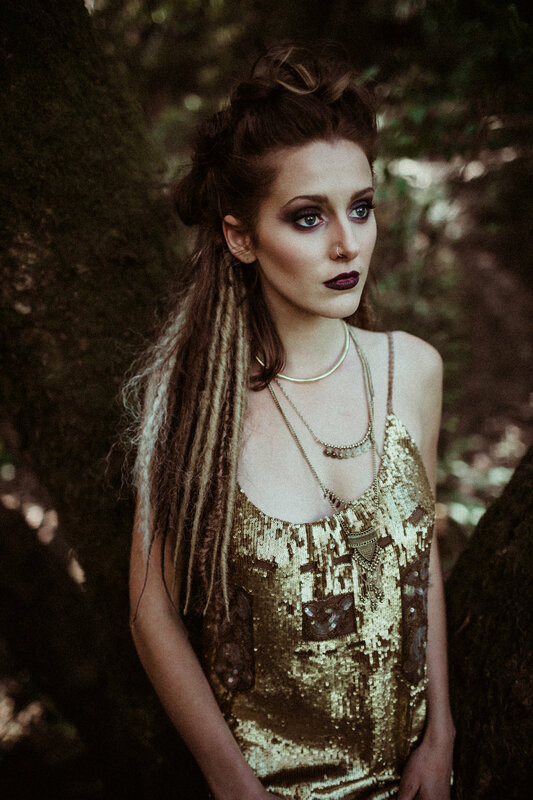 We not only wanted this shoot to be about the hair but about the landscape, photography, clothing and makeup. So first things first we reached out to a local photographer Brittany, owner of 10 Bare Toes Photography, videographer Wooyeon, makeup artist Brittany, and of course our talented team of stylist at HOC, Malyssa, Tara, Adriana, and myself, Andrea. We chose Oakland Redwood Forest Regional Park as our setting. Malyssa and I went and scouted out the park on our day off and fell in love with it, who knew our city by the bay and Mother Nature had so much to offer us? All the rain we had this winter made for a perfect backdrop. The streams were full of flowing water, moss on the trees was green as could be, nature made living walls of ferns, and the scent of nature that no one could ever duplicate in a perfume filled the air. Needless to say it was magical. Next was finding our models, Danelle, Maddison, and Sophia. We wanted to keep it small but also make a statement. We decided to go with three beauties of three different generations, with decades between the ages we were able to capture the beauty within all of us, young and old. Once we nailed down a date the artistry began, text messages back and forth on everyone's ideas, we all went through our homes/garages and offered to bring different things. Danelle, one of the models, is also a interior designer and her garage is a photo prop heaven! She asked what Malyssa’s vision was for her attire, I then proceeded to tell her “vintage” and she just whipped up that lace dress like nobody's business! It exceeded our expectations. The day came and we were all filled with excitement, after months of collaborating with some old and new friends I could see the artistic storm brewing! Photographer Brittany asked what we wanted the main focus to be, Malyssa, Tara, Adriana and myself agreed we did not want this to only be about the hair, but to be a collaboration showcasing everyone's craft. We let all the artists do their thing. I feel that when you start telling artist what to do, it holds them back and their raw talent is lost. We didn't want anyone to hold back with what was in their heart and soul on the day of the shoot. As you can see by these photos and video it was a majestic magical collaboration. I feel that we captured the innocence of a child, the confidence of the woman in her prime, and the knowledge and wisdom of a woman that has lived and has been taught by this thing we call life. This collaboration was done with ages 11 to 49, I'm proud to say i was the oldest one working on this photo shoot. The talent I saw from these young adults is undeniably EPIC! I can't wait to see what's next! Stay tuned! A Video of our adventure is also available here! Many thanks to our amazing collaborators! What happens when you're going to Las Vegas for your best friend's bachelorette party to see Britney Spears? Spice up your outgrown blonde hair with BLUE hues that will actually improve the integrity of your hair! House of Cabelo cutie, photographer Danielle Poff and blogger, decided that rather than retouching up her outgrown balayage blonde hair, wanted to hit Sin City with a splash. Her inspiration? Metallic, myriad blue hues that blend together to create the ultimate mermaid blue that is sure to make a splash wherever she goes. Using JOICO Color Intensity,House of Cabelo created a dazzling blue sure to put this cutie who is usually behind the camera, front and center and ready for her close-up in Las Vegas! Ever notice how children have the best naturally, sun-kissed highlights ever? "Hairstylists, Balayage is as essential to your toolkit as a paintbrush and scissors." Fitting as balayage comes from a French word meaning to sweep or to paint. It allows for a sun-kissed natural looking hair color – similar to what nature gives us as children – with softer, less noticeable regrowth lines. Less noticeable regrowth lines makes our clients happy and House of Cabelo always aims to not only please, but go above and beyond. And now we would like to share our wealth of knowledge with all local hairstylists with our upcoming event: Introduction To Balayage at House of Cabelo on July 9 at 10:00. Whether you are a hairstylist just starting your career or a seasoned professional—you can't afford to miss out on this opportunity to sharpen your education toolkit! So what is balayage? How does it differ from ombre? Or a highlight? House of Cabelo has all the answers to your balayage questions! With balayage, color is painted on to create a graduated, natural-looking effect, which maintains depth at the scalp—a range of tones to keep it from looking flat—achieved by a technique of not painting the entire surface of the hair at root . This color application technique results in more natural, sun-kissed color that melts into the hair and is great option for the above mentioned, lower maintenance look. How is this different from ombre? Balayage is all about how nature intended our hair to look: it is a much more natural and blended look than an ombre because it blends the top color of the hair into the bottom of the hair.On the hand, Ombre presents a stark difference between the top and bottom colors of the hair—often in an almost straight line style. How can balayage enhance our beloved highlights? When applying highlights, the color is placed at the scalp to brighten the root area—while balayage offers the lower maintenance look. By learning to combine the two, you can begin to create custom looks and achieve certain trends—expanding the services you offer your clientele and discovering just far your creativity will take you! For those of you who are still looking for more knowledge on the art if Balayage we will be having an immersive class into the world of balayage on July 9th hosted by Malyssa Hallock of House of Cabelo. Lunch will be provided and creativity will flourish! About Malyssa: Malyssa Hallock brings her 5 years experience and passion for hair color. Early on in her career she mastered the seamless effects of balayage and hair painting. Her highly requested services keeps her busy at House of Cabelo. When she isn't in the salon she can be found taking classes in Miami as the R&Co creative council member or traveling the world. She prides herself in being a perfectionist and doing the best she can. Teaching and sharing her knowledge with others has been a new found passion.